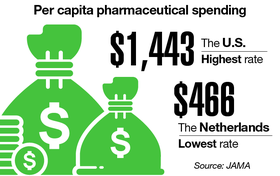 The U.S. continues to outpace other industrialized nations when it comes to healthcare spending. Researchers from Harvard University and the London School of Economics analyzed data from 11 high-income countries and found that although utilization rates were relatively similar, the U.S. spends twice as much on medical care. Labor and pharmaceuticals were key drivers for America's high cost of care. Download the PDF.